Otherwise, I CANNOT wait for you guys to read the first book in the Ascension series! This is my favorite series and while I knew it’s a bit different (YA fantasy and all), I think it’s pretty epic! Q: What is The Affiliate about? Q: What inspired you to write The Affiliate? Q: How many books is in the Ascension series? A: 4! Right now. Plus a prequel! It sounds like a lot, but I hope by the end you’ll be wanting more of Cyrene because she’s a badass. Q: Is it a love triangle? A: I’ve been getting this one since I mentioned that there were multiple guys in the book. I really think the answer to that is NO. There are two guys in the book, King Edric and Prince Kael. However, I think it is pretty clear which guy Cyrene falls for. So, they might both like her but she only likes one. Got it? Q: I don’t like to wait for books to come out because I hate cliffhangers. So I’m not going to read the Glitters series until Silver releases. A: That’s totally cool. You do you. However, THIS IS A STANDALONE SERIES! So Gold, Platinum, and Silver can all be read individually. They are about three best friends and their gold digging adventures. Diamonds (ATG, #1) can be read in combination with Gold or by itself. It’s more of a prequel to Bryna’s college story in Gold. Q: When will Platinum and Silver release? A: I’m not sure. I’m aiming for the next Glitter book to come out this fall and then next summer in an ideal world. See below. Q: You said you were going to write Clay and Savannah’s book and you haven’t. When do we get them? A: Dude, I know. I really desperately want to write Clay’s book…like stop the presses here he comes. 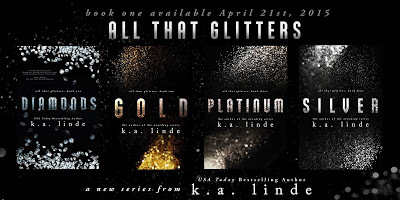 But I started the Glitters series and it is my main priority at the moment. Also, I’m FINALLY releasing my first YA fantasy book which I’ve been waiting on for three years so I’m putting that out first too. I don’t think there are anymore updates. I think that’s it. I hope that answers everything. If there are other questions…well, I can fill you in at a later date! BUT since you read to the bottom, I’m giving away an eARC of The Affiliate…just comment below or on the Facebook post! Can't wait for this book! I'm excited to step out of my traditional genre I read! So excited to read this!!! Ahhh!!! I can't wait to get my hands on everything you mentioned above!! I know!!! I can't wait for you to read it all! Currently my husband is talking to me about football (in other words in another language) and I am wishing I had a really good book to read right about now! Oh my! I can't wait to read THE AFFILIATE! Your teasers promise a book that I'm surely going to love. Totally excited to read this! I am looking forward to this new series. Fantasy is far from my normal but I trust you to give us a great story. So excited for every one of these, can't wait!! 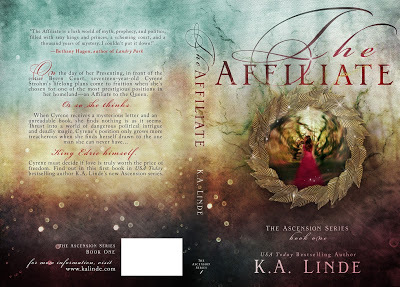 I still can't get over how awesome the cover for The Affiliate is! Love this cover and can't wait to read it! I am looking forward to this series! Thanks for sharing!!! Sounds amazing can't wait to read it!! !